Chocolate Dipped Gingerbread Cupcakes with Orange Swiss Meringue Buttercream: Moist gingerbread cupcakes topped with orange Swiss meringue buttercream dipped in semisweet chocolate and topped with a mini gingerbread man cookie. I cut out sending Christmas cards a long time ago. It first started when I had a hand injury and physically could not write or sign anything and so I skipped that year. Then realizing that I enjoyed not sending out a Christmas card I just kept skipping. Which is kind of sad for the fact that I enjoy getting Christmas cards. If I ever get my act together I will start again. 2017 was quite a roller coaster of a year both for our family and for the nation. Perhaps the biggest news of 2017 was that the hubby and I purchased a home. You might know it from the movie The Money Pit but it’s one story. I kid…sort of. But yes, it’s what one would all a fixer upper…big time. In the Seattle area market the average house is running about $550K so we had to go fixer upper. Luckily my hubby is quite the fixer upper. With the twins grown up and graduated and their mother having a very large home with a bedroom for everyone we decided to go much smaller. How small? 1248 sq. ft. Which the last two places we lived in were 2100 sq. ft..…so we have been playing where do we put this Tetris. But two people do not need a ton of space. The kitchen is dreadfully small (78 sq.ft) but we plan on expanding it and bought the house because there was room to do so. When that will happen who knows? We had planned on doing it this coming summer but some family drama is causing that not to happen. We also bought the house because of the dogs. They finally have 1/3 of an acre to call their own and roam around on. Speaking of dogs, we only added one to our family this year…which is amazing for us. 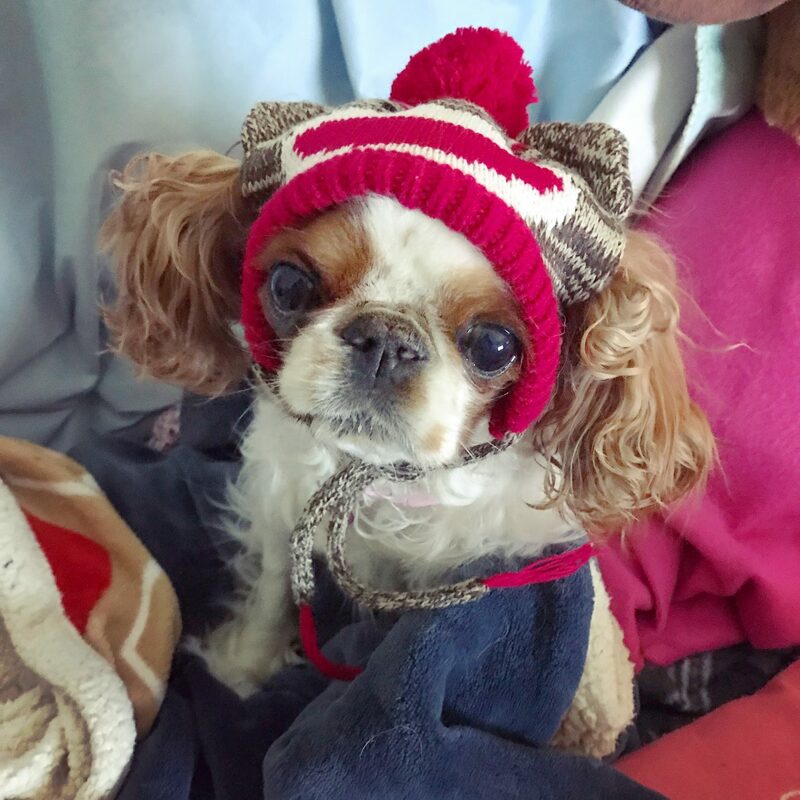 Her name is Tulip and she is an English Toy Spaniel. She comes from a puppy mill and was bought by a rescue at a USDA auction to break her free from that life. She is the youngest dog we have (almost 3 now) but she honestly acts as old as the others. Pretty much lounges around all day. And yes, she looks like a little alien. 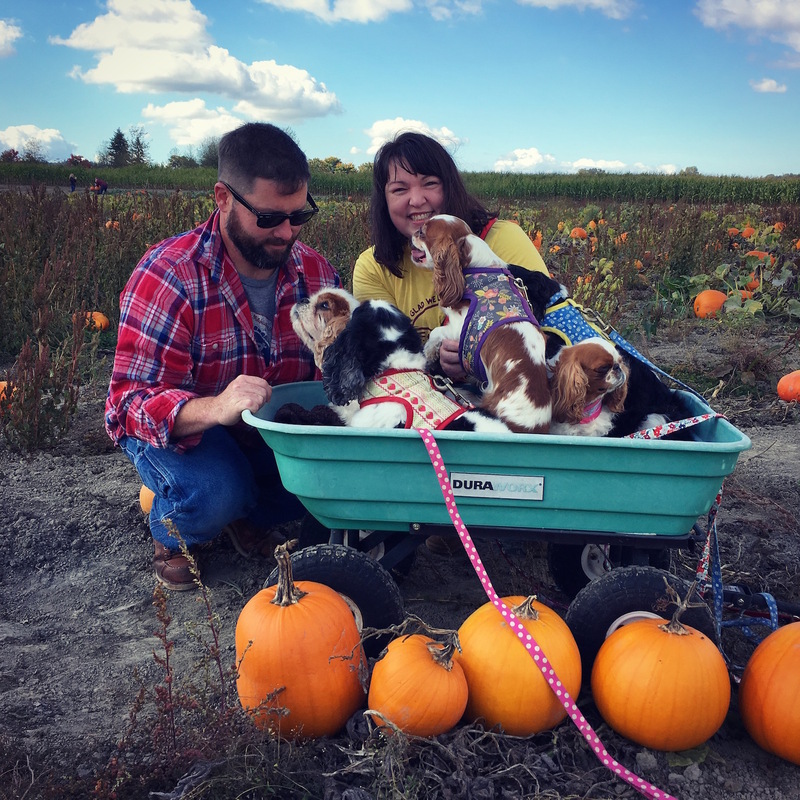 Tulip, like most puppy mill dogs, has a hard time trusting humans and we have been working with her on that since we got her in March. She’s making great strides. With Tulip that brings up the dog count to five. Yes, five. Chaos but so much love. 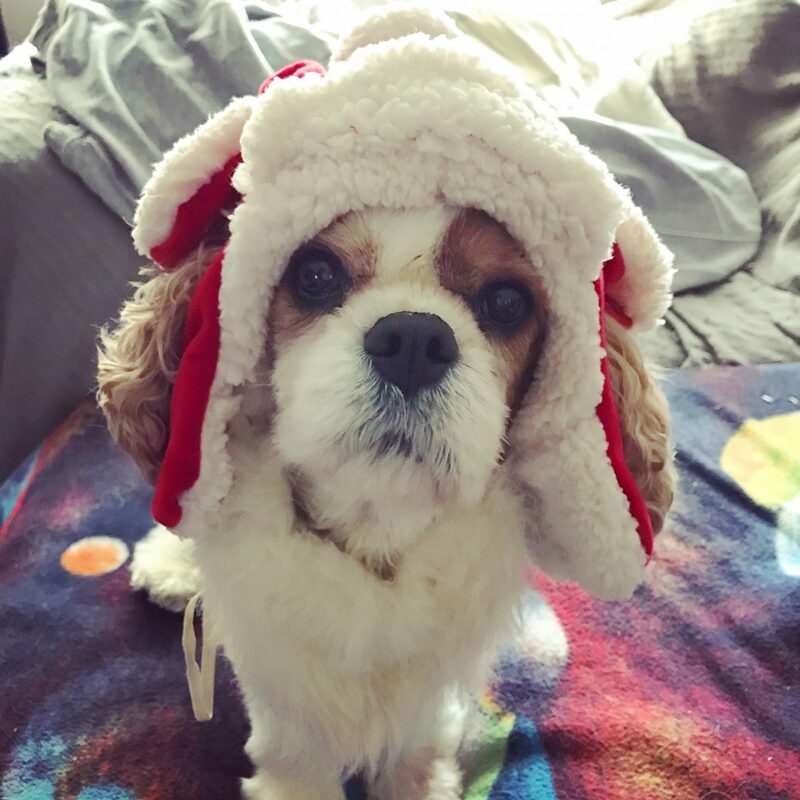 Mickey (age 10) developed a murmur this year and to add to his spinal disease, deafness, facial paralysis he now has a bad heart…as Cavaliers often do. He recently got his pain meds upped and is a much happier pup once that happened. Crissy (age 11) is doing well. 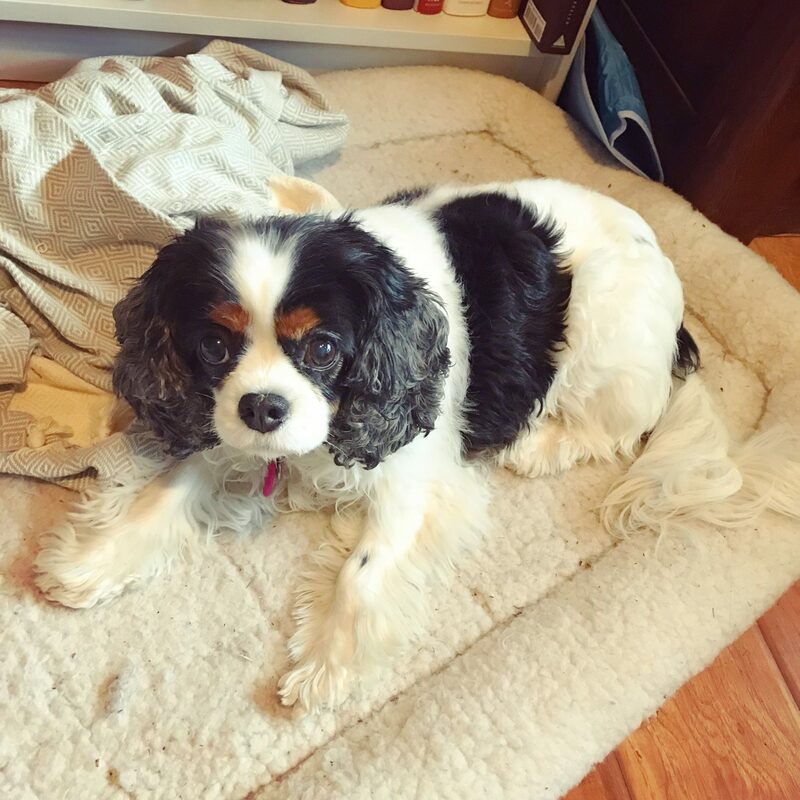 While her mitral valve disease is progressing she is not in congestive heart failure and we know that for sure as we were just at the cardiologist. She is just as sassy as ever with a heart of gold. Daisy (age 8) was our only healthy dog until this year. She also like Mickey developed a murmur but hers has progressed much more than his and she is on medication just like Crissy. She continues to be our ultimate mama dog taking care of all the pups and her humans. 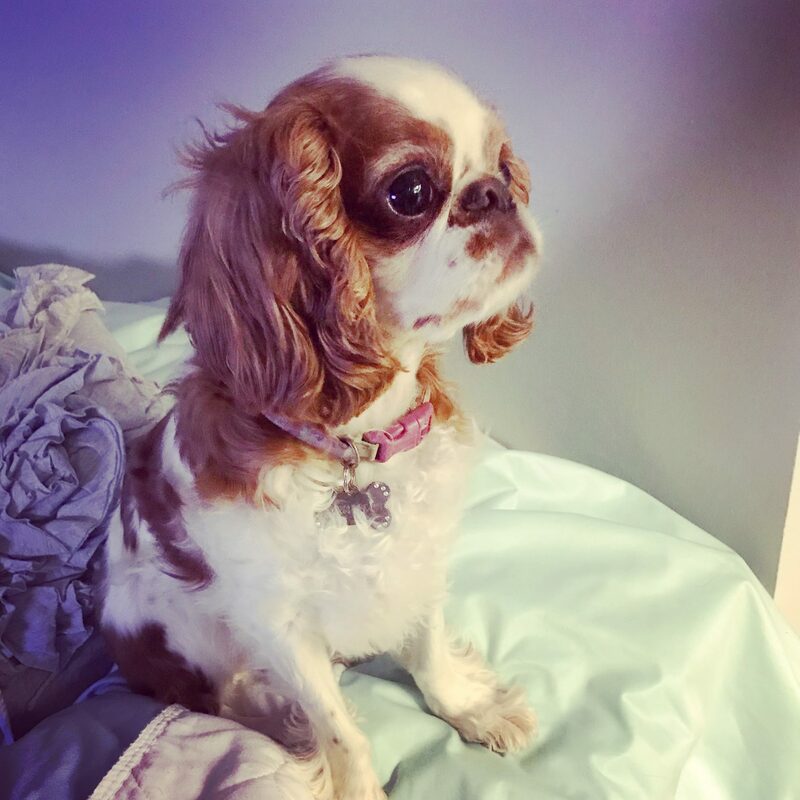 Georgia (age 6) is an English Toy Spaniel like Tulip. She comes from the same rescue as Tulip as well. Georgia, like Mickey, has Syringomeylia which is a spinal disease. She is the biggest goofball and biggest (that a 12 pound dog can be) lover. She loves everyone she meets and let’s them know that. Luckily for us, at least as I write this, we did not lose a dog this year. I hope to say the same in 2018. The dogs have their own Instagram (which is more popular than mine) if you want to follow along and look at cute dogs. My stepdaughter had one of her first great milestones as an adult…moving into her first apartment. She’s super excited and horrified all at the same time. She’s learning the joys of freedom and the reality that toilet paper cost a lot of money. 🙂 She’s working at Starbucks full time and is still dating her high school sweetheart. My stepson is living at home with his mother and working. He’s learning that being a grown up is not nearly as fun as the brochure made it out to be. 🙂 But he is doing well and seems to like his job. Like most kids his age he is still just trying to figure it all out. 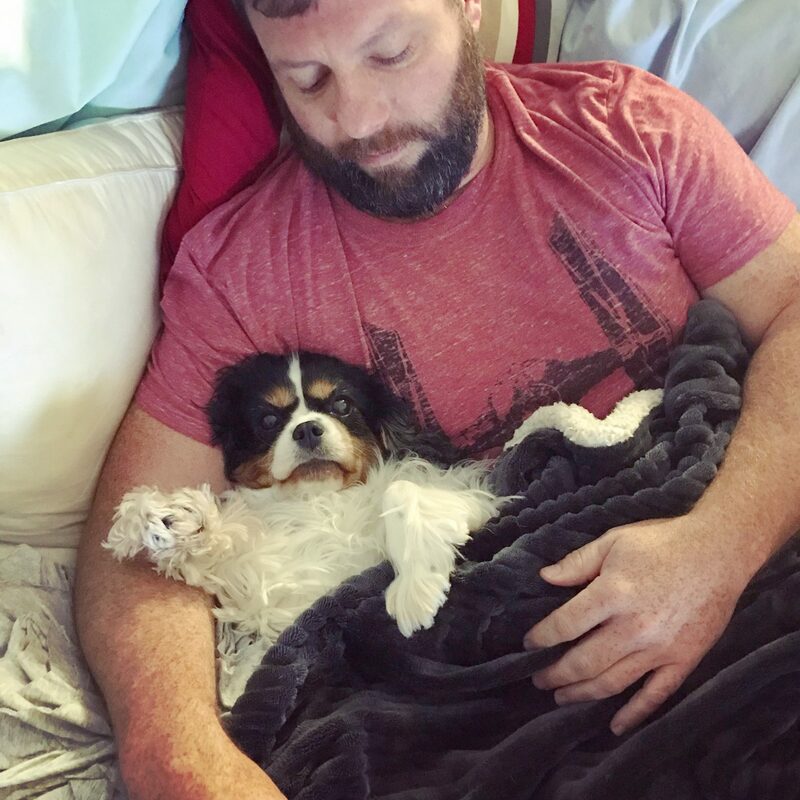 Hubs had a few health issues this year. Right now he is still recovering from a herniated disc in his neck. He had it 11 years ago and it’s in the same spot. No surgery as of yet as he is improving but it has impeded greatly with hockey playing and house fixing up. Other than that he is doing great. Absolutely LOVES working for the Port of Seattle and has now worked there for 10 years. For me this has been a rough year health wise. All three of my autoimmune disorders decided they needed to flare up. Stress plays a big factor so buying a house, as much as I love it, did cause some issues. So did some on going family strife. Sadly this also means I have not been able to play as much hockey as usual…usually missing half a season now. Hoping things will all get figured out and the stress will go way down. The blog turned 12 this year. It still makes almost no money but amazingly after all these years I still enjoy doing it. No real big plan to change anything on the blog in the coming year as I roll into year 13. Interacting with readers is still my favorite part of blogging. Despite all the health stuff I’m still chalking 2017 up as a success. I have a great life with an amazing husband and wonderful friends who make it that much better. 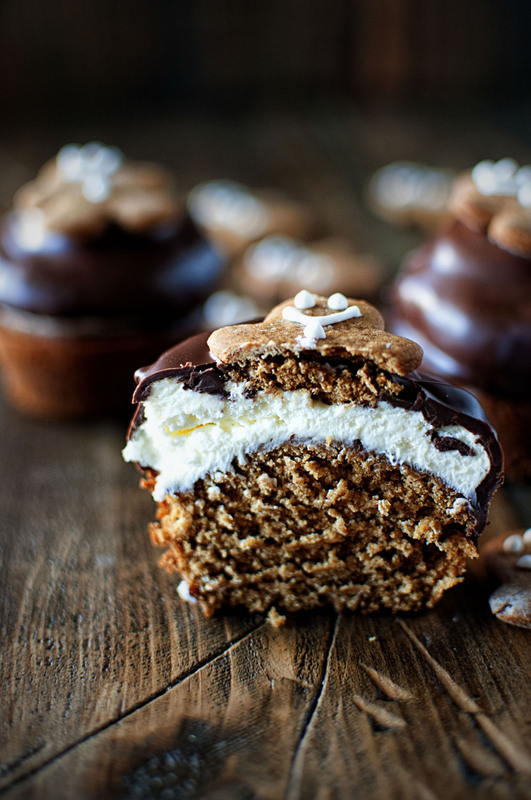 These are a moist gingerbread based cupcake topped with orange Swiss meringue buttercream and dipped in semisweet chocolate all topped with my mini gingerbread man cookies. 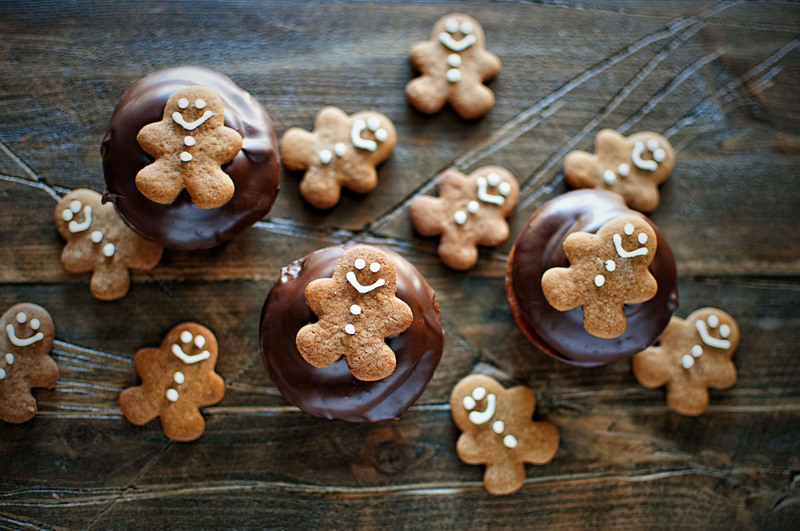 I love gingerbread and orange together and so these were just perfect. Spray two muffin pans with baking spray or line with liners. Combine the melted butter, eggs and sugar in a mixer fitted with a paddle attachment and mix until well combined. Add the molasses and water and mix. Sift the flour, baking soda, salt, and gingerbread spices together. Working in batches, and mixing after each addition, add the dry ingredients to the molasses mixture. Mix until smooth. Pour into the cupcake liners ¾ of the way full and back for 20-22 minutes depending on your oven. Let cool in pan for 5 minutes then remove from pan and place on a wire rack. Add orange zest, melted white chocolate, frozen orange juice concentrate, and salt and beat on high for 1-2 minutes until smooth and creamy. Combine chocolate and oil in a medium heat-proof bowl set over a medium saucepan of barely simmering water; stir until melted and smooth. Spoon more coating around edge of cupcake and any exposed frosting. 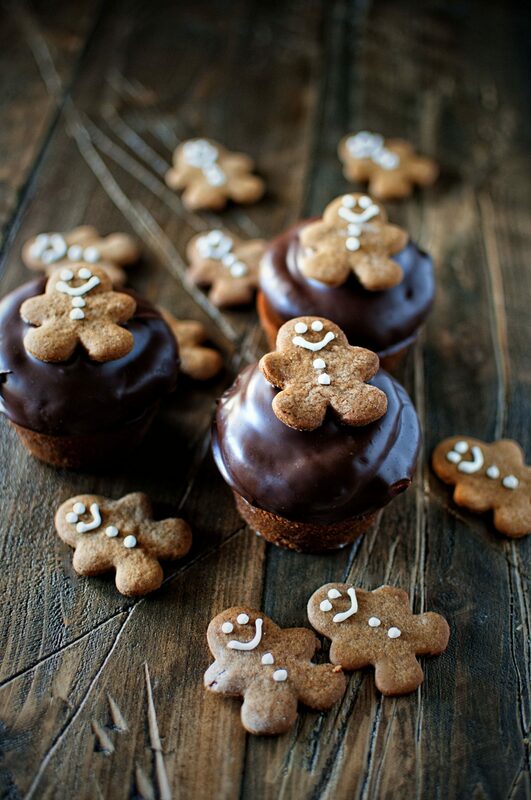 Top with mini gingerbread man cookies or festive sprinkles. Cover, and refrigerate for 2 hours more. De-lurking to wish you all the best in 2018. I have been following you for at least 10 years. Thanks for keeping at it. Thanks Karen. I hope 2018 is your best year yet! Best wishes and many blessings to you and your hubby. May 2018 bring you good health and continued happiness! Merry Christmas, Peabody! Thank you for running such a great blog … yours is one of the first I turn to when the baking urge hits. Really enjoyed the life update and the photos of the dogs. Wishing you a sweet 2018! Thank you Carrie! Merry Christmas to you as well. Merry Christmas to all of you! I always enjoy your stories and your recipes. Red Velvet Thumbprints are in the line-up right now. Hope 2018 is a good one for you. Thank you Judy! I hope you have a great 2018 and thanks for being such a long time reader!